Were these ‘Palmyrene statues’ ‘recently excavated’? At least one appears to be a forgery. I had been planning to leave this note until later, as I am supposed to be writing – and, my dear and unduly patient editors, I am writing – something on iconoclasm. However, since the evidence is being discussed, I felt I should write this now. Looking at the two ‘Palmyrene statues’ that have recently been sold through a ‘public auction in Raqqa’, I believe that at least one is fake (though I would defer to any expert, as I am not one). Through its network of archaeologists and volunteers, the Day After Heritage Protection Initiative (DAHPI) has collected evidence of trafficking of antiquities within Islamic State territory in Syria. Indeed, DAHPI coordinator Amr al-Azm judges that they have provided ‘all the basic information about how ISIS operates with regards to cultural heritage’. That comment is obviously one line from a far longer discussion between Al-Azm and Richard Engel, Aggelos Petropoulos and/or Ammar Cheikh Omar. I should note that there are other examples of investigations and analyses of the situation(s) in Syria (and Iraq) by other teams of journalists, cultural heritage professionals and citizens. Nonetheless, a volume of evidence has been released by the DAHPI. Hence, it constitutes an exceptionally important source on antiquities trafficking and related concerns. 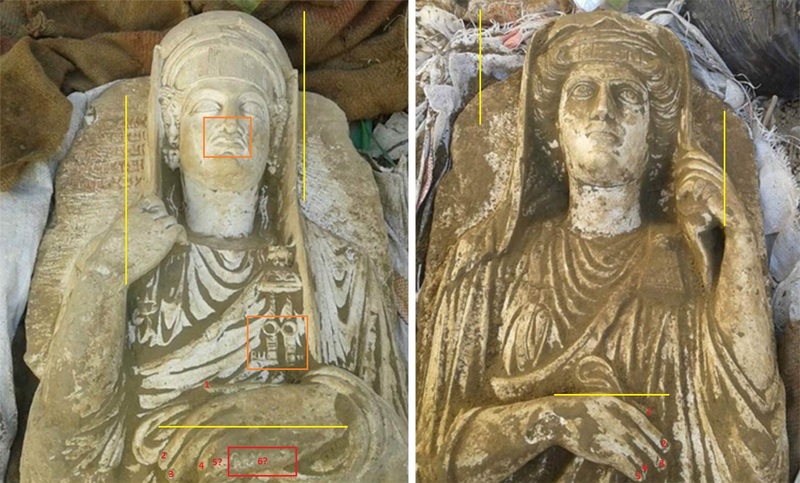 Their activists secured ‘two never-before-published photographs of Palmyrene statues which were part of a public auction in Raqqa a few weeks ago’ (March 2016). Apparently, all bidders had to offer ‘cash upfront’ and the ‘starting price’ was $150,000. Due to the overdone coating of earth, the lack of even slight, natural damage and/or the peculiar proportions, others have questioned the authenticity of the sculptures. I think it is possible to show that the objects are fake, by comparing them with each other and with examples of Palmyrene funerary portraiture/steles/reliefs/gravestones/busts elsewhere. For example, there are strange, square or right-angled adornments on the robe of the sculpture on the left that are not visible in any of the other examples. And the disgusted-looking curled lips of the sculpture on the left do not resemble the calm expressions on the faces of all of the other portraits. As the headdresses are different sizes, I have measured the faces from the lower edges of the headdresses (which is why the measurements of the faces sound squarer than they are). The face of the sculpture on the left is roughly 170 pixels from forehead (at 149) to chin (at 319) and roughly 170 pixels from side (335) to side (505). The face of the sculpture on the right is roughly 190 pixels from forehead (115) to chin (305) and roughly 170 pixels from side (1045) to side (1215). They are similarly sized. And the face of the sculpture on the right is longer, so the difference is not a false product of perspective. Hence, their hands should be comparable. The right hand of the sculpture on the right is roughly 213 pixels from wrist (1040) to fingertip (1253), the same size as the left hand and roughly 25% longer than the face is wide. Yet the left hand of the sculpture on the left is roughly 352 pixels from fingertip (298) to wrist (650), far larger than the right hand and roughly 107% longer than the face is wide. Furthermore, apart from being poorly produced and massively oversized, the left hand of the sculpture on the left seems to have six fingers. In a somewhat unexpected turn of events, some seem to have understood this post as a denial of the existence of polydactyly (where people have more than five digits on one or more of their hands and/or feet). The original title of this post asked, does one of the ‘recently excavated Palmyrene statues’ have six fingers? I am not denying the existence of polydactyly (or indeed ectrodactyly, where people have fewer than five digits on one or more of their hands and/or feet). I am denying that this is a deliberate, ancient representation of polydactyly. If my analysis is correct, who would pay at least $150,000 for a poorly made forgery of a portrait from Palmyra? The Mantis Project (Modeling the Antiquities Trade in Iraq and Syria) has conducted an open data analysis of contemporary public trading in antiquities from Palmyra (as its research director, Oya Topçuoğlu @OyaTopcuoglu, kindly notified me and other colleagues). The answer may be “no-one, not even if it were genuine”. Mantis has calculated that, if the Islamic State is selling such antiquities for such prices, ‘they are doing so at nearly double the price that similar pieces have sold for in legitimate auctions’. In other words, buyers could get them more cheaply, more easily, more quickly and more safely on the international market than they could on the Islamic State’s market. Even considering the ignorance of opportunistic buyers and the premium price for antiquities from conflict zones, such a sale appears unlikely. Moreover, if my analysis is correct, why are these objects being presented as antiquities? Why are these objects thus being presented as evidence of high-value source-end trafficking of antiquities by the Islamic State?